Here’s a yummy Halloween punch you can make and impress your friends and family…. Mix all the liquid ingredients in a large punch bowl. With black and red liquid food colour and a fine paintbrush, fashion the white jawbreakers into eyeballs. If you lack in the artistic department, don’t fret. Just go wild and have fun. The less perfect your eyeballs the better. Take a clean surgical/ plastic glove and wash the inside properly. Fill with water and seal and freeze until hard. When totally frozen remove just before serving punch from freezer. Run under slightly tepid water to loosen ice from glove and slide frozen hand out and place in punch bowl for ghastly effect. 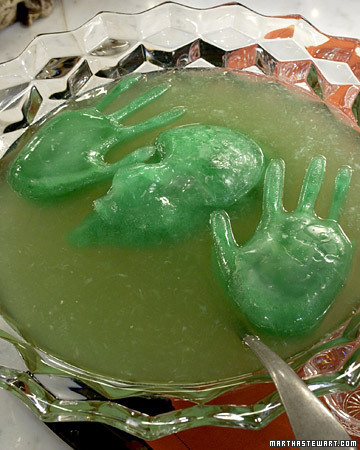 Float the eyeballs and the hand into the bowl and enjoy the reactions to your Freaky Hand Punch. ****I buy my jawbreakers from the candy shop at the Sarit Centre but these days all these pick ‘n’ mix counters at most malls have lots of jawbreakers.